Menunaikan ikrar mereka untuk berkarya bersama, pasangan Dimas dan Reuben mulai menulis roman yang diberi judul Kesatria, Putri, dan Bintang Jatuh. Paralel dengan itu, dalam kehidupan nyata, sebuah kisah cinta terlarang terjalin antara Ferre dan Rana. Hubungan cinta mereka merepresentasikan dinamika yang terjadi antara tokoh Kesatria dan Putri dalam fiksi Dimas dan Reuben. Tokoh ketiga, Bintang Jatuh, dihadirkan oleh seorang peragawati terkenal bernama Diva, yang memiliki profesi sampingan sebagai pelacur kelas atas. Washington, D.C. Reuben and Dimas, two Indonesian students studying in the U.S., are brought together by the soft trance music ing through a party at a mansion. That night they make a pact one day they will write a book, a science fiction romance that will move the heart of the masses. The tale of the Knight, the Princess and the Shooting Star. Jakarta. At an executive office, an impromptu interview between Ferre and Rana, the former a young, affluent, brilliant and well-known executive, the other the Vice Editor in Chief of a top Indonesian women's magazine � changes the course of both their lives. A rare honest interview on love, sacrifice and freedom. A sweet interchange filled with pounding hearts and piercing gaze, a gaze too deep for Ferre and Rana. They fall in love. Rana is married to Arwin, an entrepreneur from a renowned and distinguished family in Jakarta. The man Rana has chosen after the encouragement of her whole extended family, that Rana is fortunate to marry Arwin and that Arwin is a man worthy as a husband and a source of pride, chosen by the family. Ferre and Rana's beautiful story continues to unfold deeper, just like the Knight and the Princess in the kingdom of love. Both are drunk in a love they have never felt before. Ferre and Rana cannot break free from the chaos of forbidden love that feels right and the order of the private married life of Rana and Arwin, one that is acceptable but which feels wrong. Diva, a top supermodel suddenly appears in Ferre's life. Through all the chaos and order of the universe, under the starry night and the flash of a shooting star, Diva arrives. Extraordinarily, it turns out that Diva lives in the same residential area as Ferre. Their houses even face each other. 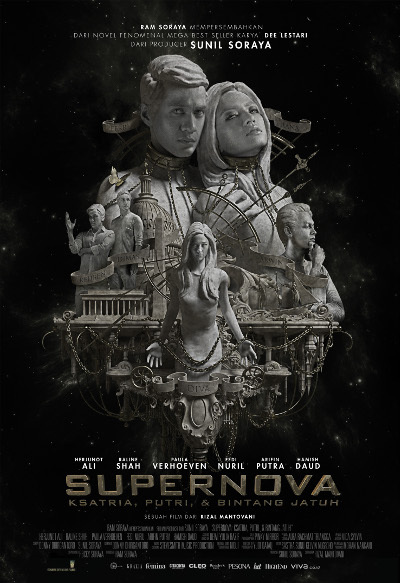 Reuben, Dimas, Ferre, Rana, Arwin and Diva eventually meet without recognizing each other in an aggressive, poetic, romantic and phenomenal blog called "Supernova". Their stories erupt together with Supernova.